Hidden Figures (2016) – Movie Review – Another Movie Blog! 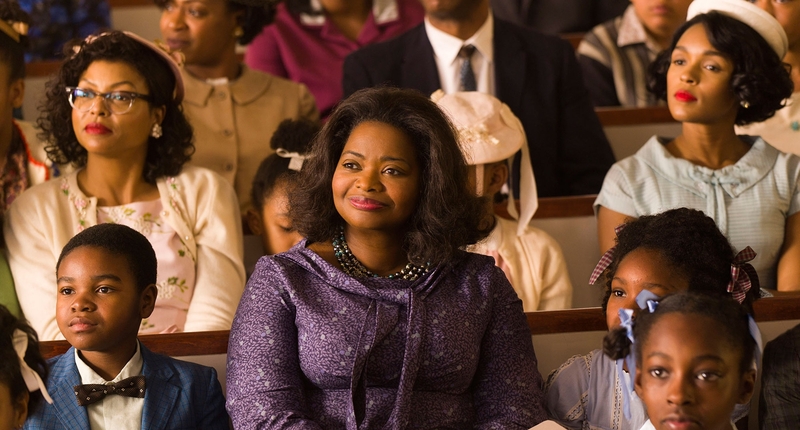 The title of Hidden Figures is appropriate in more ways than one when discussing the untold stories of the African-American women involved in the space race. Alan Turing, another recent biopic candidate in The Imitation Game, was acknowledged by history but (until very recently) unrewarded. Katharine G. Johnson, meanwhile, has been rightly rewarded for her services in calculating the flights of Project Mercury – which would eventually lead to the moon landings – but is a name known to few. Therefore, the movie makes this recognition its mission statement, as indeed it does for Dorothy Vaughan and Mary Jackson, all of whom the film wants to present as geniuses and boundary pushers of their mathematic fields. There’s the obvious racial component as to why these stories remain hidden, but it is also fair to say that math and equations are not the go-to stories made into films. The script tones down this part of the story in favour of the personal lives of its characters, a real shame considering the weight of their achievement. But it does not neglect its presence as a visual element, with huge chalk boards and prongs of men gathered around them, Katherine and our other leads standing out amongst the pack. Taraji P. Henson commands grace and a reserved struggle as the most prominent of the three stories, and Octavia Spencer is also great (even though, of the leads, her conflict has the least progression). But it is Janelle Monáe who radiates magnetism from first scene to last, and between this and Moonlight is the breakout star of this year (if one did not already love her for her music, which you absolutely should be listening to). It’s also worth shouting out Glenn Powell, putting his charisma from Everybody Wants Some!! to good use as astronaut John Glenn. The movie wears its intentions on its lapels, but one smart decision taken is that it does not portray the racism in its society of as the domain of the “evil” (like The Help). A modern audience can disconnect from overt racism when they can’t see how it could inhabit their own morals, but showing the all-encompassing prejudices of time, from Kirsten Dunst’s short role to even the sexism of Katherine Johnson romantic interest (played by Mahershala Ali, another Moonlight alumni who is having a good year), makes it more palatable. But one scene involving segregated bathrooms is the most showboating moment to a contemporary crowd, and compared to most of the movie the struggle and resolution feels dishonest (even if these events were as they happened). Jim Parson’s inclusion as an antagonist also feels unnecessary, but his presence is emblematic of the film’s conflict in general: harsh, but not too harsh. That is true also true of Theodore Melfi’s direction. If there is the standard way to cover a scene, he will shoot it in standard coverage. That does not have to be inherently bad of course, but the formulas that Melfi is dealing with are not as complex as his characters. Speaking of which, Mary Jackson (Monáe) disappears for a good third of the running time, and considering her taking on of the courts is the most “movie” segment you could imagine is surprisingly played down and neglected. That makes sense considering, after about the half way point, the plot becomes a less a string of connected events and more a series of things that happen. Hidden Figures existence, like many corny but decent biopics before it, will be in the classrooms of school children in history lessons. But those movies exist for a reason. Those places are where we learn, that make an impact. And in these rarely told stories the figures will find a place in everyone’s history.